Mr. Bob Waleck has been teaching Physical Education to students at Robert Fulton for the past 17 years. He teaches grades 3-8 and coaches the school's Track and Field team. 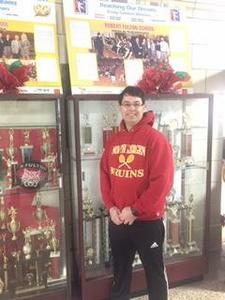 In addition, he also coaches the Girl's JV Tennis team at NBHS. Mr. Waleck’s professionalism and dedication to our school has been evident from the beginning of his career here at Fulton. Mr. Waleck has always conducted his physical education classes with a goal of students not only becoming physically fit, but also with a knowledge of the sports and activities which they are learning. Mr. Waleck employs various educational strategies, including cross-curricular instruction. Music and Technology are often being used in his class. Mr. Waleck differentiates instruction in creative ways, so that all students can participate and succeed. Mr. Waleck volunteers as our school’s track and field coach, spending many hours of his own time training the students for the annual district tournament. His teams regularly earn top honors for their performance thanks to Mr. Waleck’s coaching. He also serves as a district tennis coach, and our school’s environmental club moderator. Mr. Waleck dedicates himself to these positions with a great deal of enthusiasm.